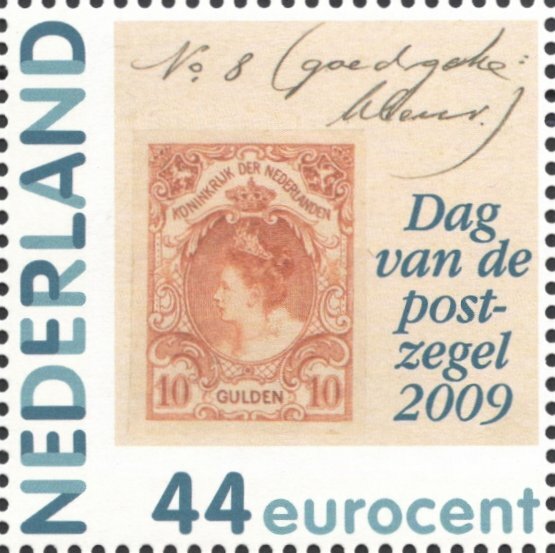 For a few years now, the Dutch Post has marked "Stamp Day" with a special issue. 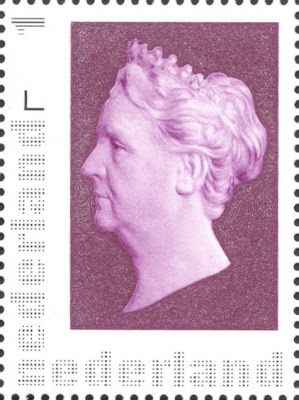 As a collector of Queen Wilhelmina stamps that has made me very happy, for the issues have so far all centred around her stamps. And some of them consist of images of rare material. In 2009, for example, the stamp included an image of an approved colour proof of the 1905 10 guilder high value, the key value of the set and probably of the whole period. And the stamp issued just last year is even better, I think. It included a picture of an early stage in the design phase of what was to become the 1948 Hartz series, named after its designer. You can see a picture of the eventual stamp on a former blog post here. The fact that Enschedé, who printed all the original stamps, seems to have managed to hang on to almost all of its proof material, means that such items will never be part of anyone's collection, and these new stamps are the only way to include them. So far, I had only been able to find proof material for stamps issued in the colonies, which is much more readily available. 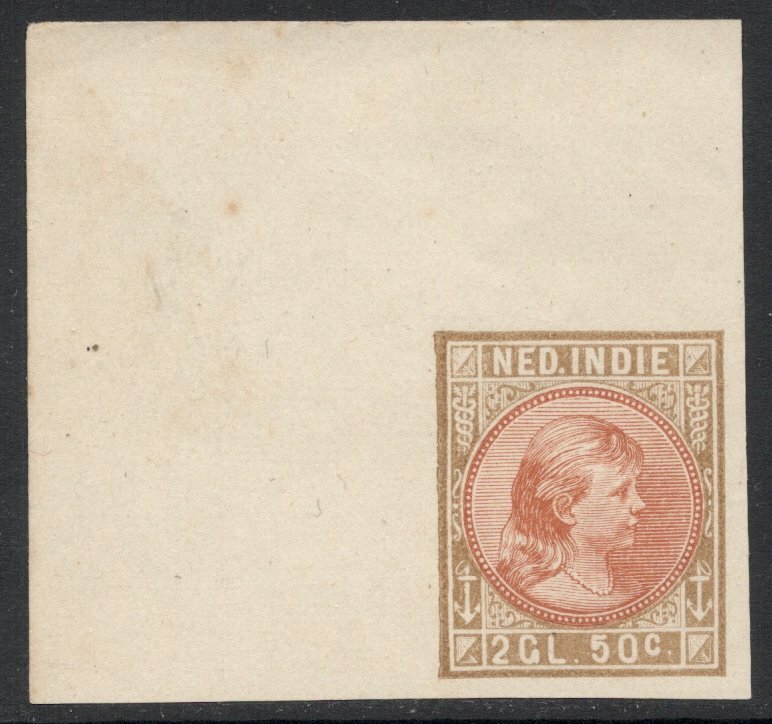 The 19 colour proofs for the Dutch Indies 1892 set, for example, do get offered from time to time, and I'm well on my way to complete that set. So you can imagine my utter amazement and joy when I suddenly saw this rare item up for grabs at auction. It forms a vital link in the history of the 1923 Silver Jubilee set. 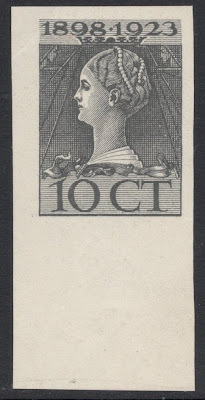 The recess-printed set was to have consisted of two values only, as a proper commemorative issue. It was subsequently decided to enlarge the set to eleven values, including three high value stamps. Enschedé could still cope with that, but when it was then decided to change the commemorative set into an emergency definitive set (the existing set had been forged too often, and a new set wasn't ready yet), Enschedé panicked. No way could it produce masses of recess-printed stamps at such short notice. That's why the company decided to make proofs of stamps printed in lithography, of which this is one. The proofs were rejected though, and Enschedé had no option but to go all out to produce the stamps in the time-consuming method of recess-printing. So, I know you wrote this on Monday. 'Fess up - did you buy the other one? Update! The auction hasn't finished yet but the price has already gone above my limit so I'll have to let this one go I'm afraid.